Will New Yorkers care that the president of the United States headlined a fundraiser in their city 24 hours after 29 people were wounded by a pressure cooker bomb packed with ball bearings in the Chelsea neighborhood of Manhattan and said nothing about the attack? 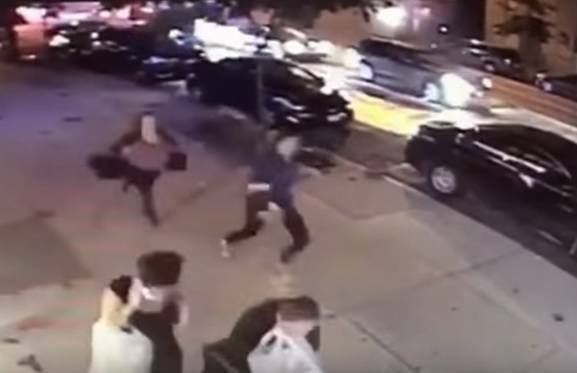 Video image of people fleeing bomb explosion in New York City Saturday night. That’s what happened Sunday night when President Barack Obama spoke at a high dollar fundraiser at the home of restaurateur Danny Meyer, owner of Shake Shack. Pool reports from the event show no comment from Obama about the attack that was actually two pressure cooker bombs set four blocks apart. The second one failed to detonate and was taken for examination by authorities. There was also a similar bomb that exploded in New Jersey earlier Saturday that targeted a Marine Corps charity run without wounding anyone while in Minnesota a mass stabbing attack by a Somali Muslim that wounded nine was claimed by ISIS. Obama did speak about Hillary Clinton’s troubled presidential campaign against Donald Trump blaming Rush Limbaugh, Fox News and sexism for Clinton’s flailing campaign. Kerry Picket with the Daily Caller reported before the fundraiser that Obama had no plans to make a statement on the terror attacks. Pool reports from the fundraiser reported by reporters covering Obama and the Clinton campaign made no mention of Obama saying anything about the Saturday terror attacks in New York, New Jersey and Minnesota.